The Poodle is one of the most easily recognizable dog breeds out there. With his curly coat and his bright and bubbly personality, these dogs make wonderful pets. What’s more, there are three different sizes to choose from, so you can pick the Poodle that best suits your family! Because there are three different sizes of Poodle, each type has its own unique feeding requirements. Keep reading to learn more about the nutritional needs of Poodles and how to meet them. You’ll also receive recommendations for the best dog food for Poodles of all three types. What do you look for when shopping for the best dog food for Poodles? What Are the Top 5 Best Dog Foods for Poodles? How Much Should You Feed Your Poodle? Are There Any Food Allergies or Related Health Issues? The Poodle breed is broken down into three varieties by size – the Standard Poodle, the Miniature Poodle, and the Toy Poodle. Standard Poodles are the largest, standing more than 15 inches tall and weighing 40 to 55 pounds. Toy Poodles are the smallest size, standing under 10 inches tall and weighing 5 to 10 pounds. Miniature Poodles are in between, standing 10 to 15 inches tall and weighing over 10 pounds but under 15 pounds. Nutritional Balance. All Poodles require a diet rich in lean proteins and healthy fats with digestible carbohydrates to provide dietary fiber. Caloric Intake. The three different Poodle varieties have different calories needs – the smaller types need more calories per pound of bodyweight than the Standard Poodle due to their fast metabolisms. Quality Ingredients. The quality of your dog’s food has a direct impact on his health and wellness, so choose a product made with whole food ingredients that doesn’t contain artificial additives. Easy to Digest. Though Poodles are no more prone to food allergies than any other breed, they can develop sensitivities – choose a product made with digestible ingredients and probiotic supplements. Choosing the right food for your Poodle is very important – it will have a significant impact on his health and longevity. Be sure to pick a dog food that is formulated for dogs of your Poodle’s size, whichever of the three varieties he happens to be. 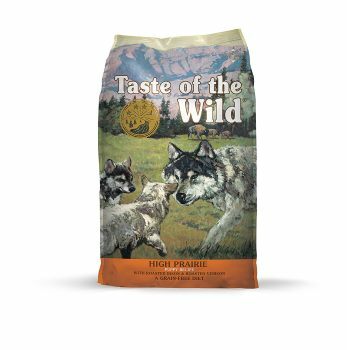 Made with premium roasted meats, this Taste of the Wild High-Prairie Puppy Recipe would be a great choice for all three Poodle varieties. This formula features roasted bison and venison in a grain-free, nutritionally balanced recipe. It contains no grains or artificial additives and is packed with healthy nutrients and beneficial supplements like probiotics, prebiotics, and chelated minerals. Buffalo, Lamb Meal, Sweet Potatoes, Egg Product, Pea Protein, Peas, Potatoes, Canola Oil, Tomato Pomace, Roasted Bison, Roasted Venison, Beef, Flaxseed, Potato Fiber, Natural Flavor, Ocean Fish Meal, Salmon Oil (A Source Of Dha), Salt, Dl-Methionine, Choline Chloride, Taurine, Dried Chicory Root, Yucca Schidigera Extract, Tomatoes, Blueberries, Raspberries, Dried Lactobacillus Plantarum Fermentation Product, Dried Bacillus Subtilis Fermentation Product, Dried Lactobacillus Acidophilus Fermentation Product, Dried Enterococcus Faecium Fermentation Product, Dried Bi Fidobacterium Animalis Fermentation Product, Vitamin E Supplement, Iron Proteinate, Zinc Proteinate, Copper Proteinate, Ferrous Sulfate, Zinc Sulfate, Copper Sulfate, Potassium Iodide, Thiamine Mononitrate (Vitamin B1), Manganese Proteinate, Manganous Oxide, Ascorbic Acid, Vitamin A Supplement, Biotin, Niacin, Calcium Pantothenate, Manganese Sulfate, Sodium Selenite, Pyridoxine Hydrochloride (Vitamin B6), Vitamin B12 Supplement, Ribofl Avin (Vitamin B2), Vitamin D Supplement, Folic Acid. 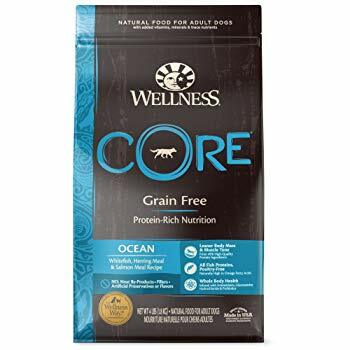 This Wellness CORE Grain-Free Ocean Formula is a great choice for Standard Poodles because it is rich in both animal proteins and healthy fats – omega fatty acids, in particular. In addition to helping your Poodle sustain his lean muscle mass, this recipe also supports healthy skin and coat. Plus, it contains fresh fruits and vegetables as natural sources for key nutrients with joint-supporting glucosamine and chondroitin supplements. If you’re looking for a nutrient-dense recipe for your Miniature Poodle, consider this Wellness Complete Health Small & Toy Breed Adult Recipe. This recipe features farm-raised chicken, brown rice, and sweet potatoes in a protein-packed, nutritionally balanced dog food that comes in small kibbles. This formula features plenty of antioxidants for immune health as well as dietary fiber for healthy digestion. 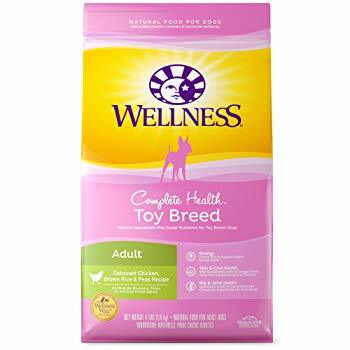 Formulated specifically for toy breeds, this Wellness Complete Health Toy Breed Adult Recipe would be a great choice for your Toy Poodle. Not only does it contain deboned chicken as the first ingredient, but it contains digestible carbohydrates like brown rice and peas. This formula comes in a smaller kibble size and contains only premium natural ingredients – no fillers or artificial additives. 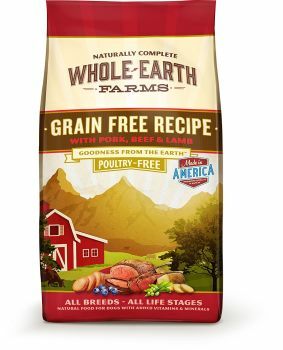 Brought to you by Merrick, one of the top dog food brands on the market, this Whole Earth Farms Grain-Free Chicken & Turkey Recipe is an affordable choice that would work well for all three Poodle varieties. Made with premium animal proteins and quality carbohydrates, this recipe is highly digestible and nutritionally balanced. There are also several other recipes to choose from. 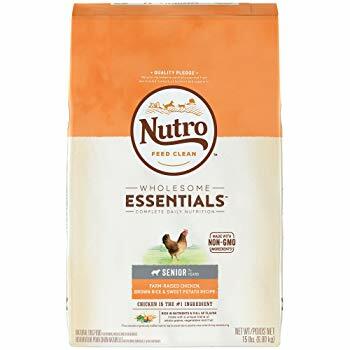 Your Poodle needs a high-quality dog food that provides a blend of lean proteins, healthy fats, and digestible carbohydrates as well as essential vitamins and minerals. Adult dogs need a minimum of 18% crude protein and 5% crude fat in their diet with no more than 5% dietary fiber. Fiber is important for healthy digestion, but too much of it could have the opposite effect. You should also know that your dog’s nutritional requirements may vary slightly depending which variety you have. Toy and Miniature Poodles have very fast metabolisms, so they may need anywhere from 40 to 55 calories per pound of body weight each day while a Standard Poodle may only need 35 to 45 calories per pound. Choose a formula designed for breeds of your dog’s size and really focus on quality ingredients and balanced nutrition. Toy Poodles – This type of Poodle has a very fast metabolism, so they need a calorie-dense formula that comes in small, bite-sized kibbles. Choose dry food over wet food because toy breeds are prone to dental problems and dry food will keep his teeth cleaner. Miniature Poodles – These Poodles are very active, so they require a calorie-dense diet made with high-quality, digestible ingredients. They can also benefit from dry food to keep their teeth clean and healthy fats for skin and coat quality. Standard Poodles – Puppies need to have their growth controlled to avoid musculoskeletal issues in adulthood, so choose a large-breed formula. In adulthood, focus on protein to maintain lean muscle mass and consider supplements for joint support. In general, you should also be mindful of food allergies and sensitivities. Poodles are prone to skin problems which can be triggered by food allergies and many dogs of this breed have sensitive stomachs and digestive systems. The amount of food you offer your Poodle on a daily basis depends on several factors. 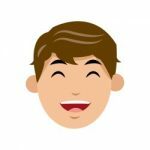 First and foremost, you have to consider the calorie content of whatever recipe you choose – some formulas are very high in calories, so you may need to limit the amount you feed. Adult dogs should be fed size-specific formulas made with quality ingredients – feed Standard Poodles twice a day and the smaller varieties 2 to 3 times a day. Reduce your senior Poodle’s caloric intake to account for his slowed metabolism but make sure his food is still rich in lean protein. Generally speaking, the best thing to do is choose a high-quality dog food formulated for dogs of your Poodle’s size and then follow the feeding recommendations on the package according to his body weight and his age. Poodles are no more or less prone to food allergies than other breeds, but it is still something you should keep an eye out for. Some of the most common signs of food allergies in dogs are skin-related. This can be confusing because Poodles are also prone to skin problems like sebaceous adenitis. If your Poodle develops chronic skin problems or recurrent ear infections, take him to the vet to discuss the possibility of food allergies. Even if your Poodle doesn’t develop a food allergy, he could still be sensitive to certain ingredients. Low-quality fillers and certain grains like corn, wheat, and soy are the most likely to cause problems but artificial additives can affect your dog’s digestion as well. Consider feeding your Poodle a Limited Ingredient Diet (LID) made with novel protein and carbohydrate sources to reduce the risk of triggering food allergies and sensitivities. The Poodle is a wonderful breed that comes in three different sizes, each with its own unique temperament and personality. To ensure that your Poodle enjoys a long and healthy life, take the time to learn about his unique nutritional needs and then choose the best dog food for Poodles to meet those needs. Best of luck!